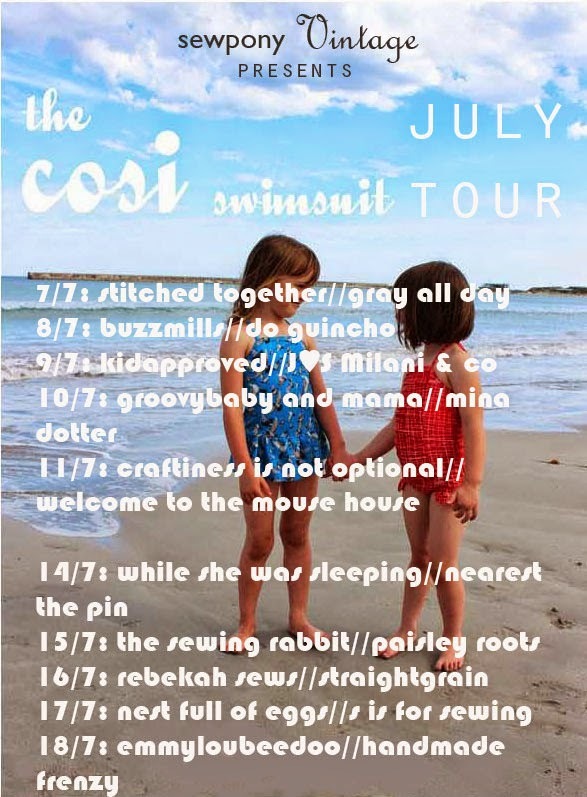 Today Trine and Isabelle join me on my cosi swimsuit pattern tour. Trine writes the popular Danish blog, Groovybaby...and mama. She sews awesome clothes for her four kids and she sews just as many cool things for herself. She her most recent sew - this lovely jacket!! The dresses Trine makes for her six year old daughter Wilma, are some of my favourites. She often uses vintage fabrics - like this one she made for Vintage May. Trine guest posted for my When we were young series with a beautiful vintage brown and orange floral dress - and a matching one for herself. I love them both. So I am very excited to share Trine's cosi here today. She made view A for Wilma and I can't wait to see more. Head over to Groovybaby...and mama to see more! Isabelle's blog, Mina Dotter, is relatively new to me. Isabelle applied to test my cosi pattern and when I checked out her blog, I knew she would be a great person to have on board (See her two piece here). She is also a popular European blogger - this time from Belgium. She sews mostly for her three daughters. Her sewing and photography are great and I look forward to seeing more of her creations. She actually has a similar style of sewing and photography to Trine, I think! She makes lovely things for herself too. Isabelle made View A for the tour also, and in perfect time - just before heading off to Croatia on holiday! See her lovely baby blue cosi here. Thank you so much Trine and Isabelle. Your suits are awesome!! Please come back tomorrow to see what Jess and Hayley have made! See Day 3's makes by Olga and Stacey here.